It looks like our trade was closed out as EUR/CAD touched above the resistance area around 1.5200. Our trade was stopped out for a loss of 1%. Good afternoon! 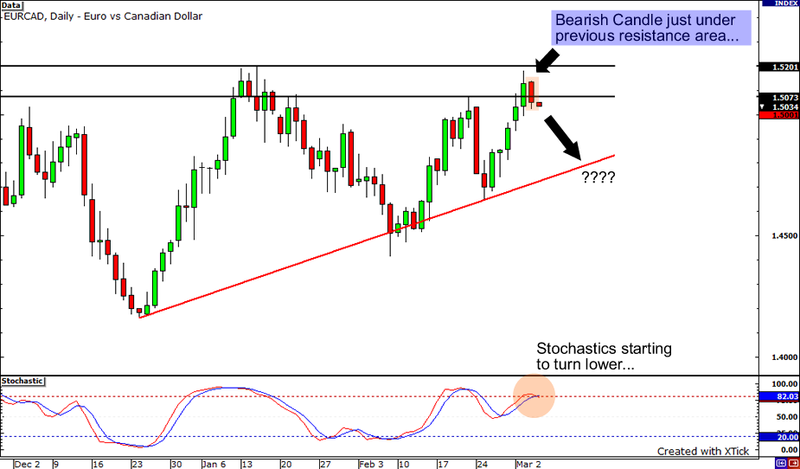 We are gonna take a look at EUR/CAD as it is making an ascending triangle pattern on the daily chart. On the chart, we see a bearish candle form just under the resistance level 1.52. With stochastics turning lower from overbought levels, it doesn’t look like this pair will break higher any time soon. Fundamentally, we see oil sustaining prices above $100 a barrel today as it touches above $104 today. This may help the Loonie in the short run. We are running a stop of almost 200 pips, so remember to adjust position sizes to stay within comfortable risk levels. Never risk more than 1% of your account on any single trade.